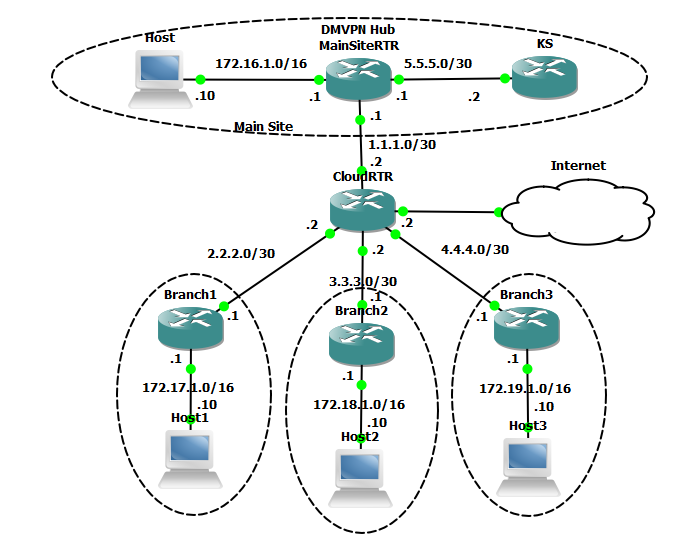 Just recently I covered DMVPN, which is a great scalable system for adding new sites to your network infrastructure and have them join an existing VPN solution without the need to add extra config at the ‘hub’ site. 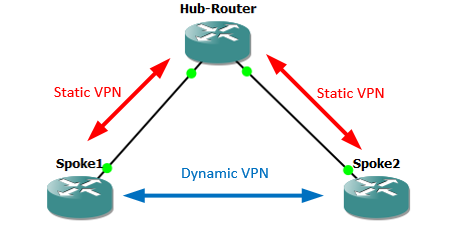 One of the advantages of DMVPN is it maintains VPN connections from your ‘Spoke’ sites back to the ‘Hub’ site, but if a spoke site needs to speak to another spoke site, it will dynamically build a VPN tunnel to that spoke site. That’s great right? Well it’s pretty cool, but there is a downside. There is a slight ‘lag’ while that dynamic VPN is established, for normal network traffic you probably wont even notice, but if you are sending streaming media, or voice traffic then it becomes more of a problem. So if we had a system where all the routers have all the same settings, the hub router wouldn’t need to ‘broker’ the initial connection and the routers get all their VPN settings from a central ‘Server’. Well that’s what GDOI gives us, we set up a router as a central ‘Key Server’ and all the other GDOI ‘Group Members’ register with the key server, and get all their settings. So I’ll use the same network that I built the DMVPN on, I’ve added another router that will be the ‘Key Server’, other than that the topology is the same. Note: The GDOI Key Server, cannot run on the DMVPN hub router. 1. Firstly setup the requirements for ISAKMP phase 1. Note: here I’m using pre-shared keys, this does not scale well if you have a lot of sites, you might want to look at a PKI solution and use certificates instead. 2. Then setup IPSEC phase 2 requirements. With a transform-set and a profile. 3. The Key server will use its certificate for authentication, if you DO have a PKI solution and this router has already enrolled to it then you can skip this step. If not you need to generate a LOCAL certificate on the key server. (Note: This requires the device to have a hostname and domain name set). 4. To setup the key server, create a group (GDOI-VPN) and give it an identity number,all members of the group will share this number. It used the profile we created above, and will apply encryption based on ACL 123 (we will create in a minute). Finally it sets the IP that it will be used as the key servers (this is the IP in use on FastEthernet 0/0). 5. Create the ACL we specified above, this ACL will get downloaded to all the group members. As will the VPN profile, they will then apply that profile to traffic defined in the ACL. It’s an ‘interesting traffic ACL, (if you are used to working with VPN’s). Note: These settings are the same for the DMVPN hub router and all the spoke routers. 6. As above we specify a matching phase 1 policy. 7. Then join the router to the GDOI group. 8. Then use that group to create a ‘crypto map’, and apply that map to the public interface that ‘faces outwards’. Note: Normally when applying encryption to DMVPN you would apply your crypto to the tunnel interface, with GDOI you do NOT. 9. Now I could add a route to my DMVPN network, with a static statement (i.e. ip route 192.168.0.0 0.0.255.255 Tunnel0), but I’m using EIGRP anyway, so I can just advertise the DMVPN network into my EIGRP group. Below I’ll show the configs, with the GDOI config highlighted in Red and the DMVPN config highlighted in blue.